Livali Review : Does It Really Work? Livali is advertised as a premium care solution made for adults that want to counteract the aging effects in form of wrinkles and other skin imperfections. The product claims to be an “ageless moisturizer” which can help to revitalize your skin cells and recapture a youthful appearance. In its essence, it is an anti-aging cream that can hydrate your skin and bring potential long-term benefits for your skin health. The product is intended for facial and neck area and is recommended to be combined with the Livali Ageless Eye Serum for optimal results. Who Is the Manufacturer of Livali? The label indicates that the product is made in the United States. However, the manufacturer itself is a company of the same name based in Toronto, Canada. They design skincare products with a particular focus on anti-aging solutions. The company proudly states the fact that their products are not tested on animals. If you have any questions, there is a contact phone and an e-mail you can use for contact. Livali is a wrinkle cream directly applied onto the skin, which means that it utilizes transdermal technology to deliver potential results. As for the formula itself, many ingredients, such as Aloe Vera, and cucumber extract, aim at providing extra hydration for the skin. That may help it to retain moisture and secure plumpness and youthful appearance. The product also contains compounds like vitamin C that boost collagen production and may iron out wrinkles, fine lines, and other imperfections. Finally, the antioxidant traits of the formula can help to protect the skin cells from oxidative stress and free radical damage. Livali Ingredients – Are They Safe & Effective? Cucumber Fruit Extract – It can play a role in hydration of the skin and it has certain antioxidant traits. The list of other compounds include linden tree leaf extract, ginseng root extract, avocado fruit extract, sodium EDTA, iodopropynyl butyl carbonate, Diazolidinyl urea, propylene glycol, sodium carboxymethyl beta-glucan, squalene, ubiquinone 50, caprylyl glycol, butylene glycol, Phenoxyethanol. What Are the Advantages of Livali? What Are the Disadvantages of Livali? How Should You Take Livali? The directions indicate that you should use Livali twice each day, although they leave the option to use it on as needed basis. When you want to apply the product, cleanse your face first. Next, take a small amount of the product and put it on your face and neck area. Use gentle moves to massage it into the skin. Give it some time to fully absorb and then move on to putting makeup on. How Much Does Livali Cost? The manufacturer’s website indicates that it doesn’t accept new orders anymore, but you can try to find a store that sells the product. $4.97. As for the regular prices, they were set at $89.97 per bottle, which is actually the price of a monthly supply through the auto-shipment program. What Is Livali’s Return Policy? All sales made through the website were eligible for a full refund for 30 days since the credit card was charged to return the product. However, there was a 15% restocking fee involved when you ask for a refund. Does Livali Offer a Free Trial? While the manufacturer accepted new orders, there was a chance to evaluate the product for 14 days, but that doesn’t seem possible right now. Livali is an anti-aging skincare solution that may help you to iron out wrinkles by boosting collagen production. However, you may be required to patiently wait for results while applying the cream regularly. The cream can be helpful in revitalizing your skin cells and achieving a more youthful appearance, but it may take several days until the skin gets used to the product. Also, the long list of ingredients increases the chances for an allergic reaction, so it is advised to carefully check the list of compounds included. 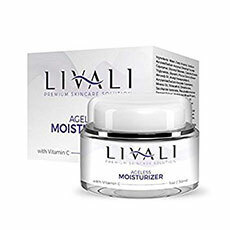 Finally, Livali can help to moisturize your skin and protect it from oxidative stress and free radical damage. However, it seems that the manufacturer doesn’t accept new orders for the solution anymore, which means that the only option left is alternative buying channels. Keep in mind that a smart buyer always checks multiple options prior to purchasing a product. That is why we advise taking a look at other available products in this category and their reviews. It is the only way to be sure that you made the right definitive decision.